Rufus Mink, Calem Mink, Thompson Mink, John B. Mink, Hiram Mink, Amos William Mink, Daniel Mink, Harvey Mink, James Mink, Jane Mink, Martha Mink, Mary Mink, Sarah Mink, William Joseph Mink. William Mink is believed by many to be descended from Anders Classon Mink who was an early colonist to what later became the United States. Anders Classon Mink arrived direct from Gothenburg, Sweden on the ship Kalmer Nyckel July 1641, arriving in New Sweden (Delaware River area) on Sunday, November 7, 1641. He was an involuntary emigrant as were many that came over with their employer, "The New Sweden Company". Anders was listed as "herding 'The Companies' swine herd in 1644, but became a freeman in 1646." Children were Paul Paulson Mink and Clas Andersson Mink. Anders was either Finnish or Swedish as many of the "involuntary emigrants" were Finnish. Spelling variations of the surname Mink include Minks, Minke, Minch, and Menk. According to "The World Book of Minks" the Mink surname means "descendant of Menk, a pet form of Meinhardt". Because there are many descendants of the Germanic peoples, the Mink bloodline also contains Swiss, Swedish, Norwegian, and Dutch ancestry. Not as well known is there was a Swedish Colony called New Sweden in what is now Delaware, from 1638 - 1655. At this time Sweden was one of the major military and political powers on the European continent. By mid 1600's, the kingdom included part of Norway, all of Finland and stretched into Russia. Sweden had control of portions of modern Poland, Latvia, Estonia, Lithuania and Germany. The first Swedish ships reached Delaware Bay in March 1638, and the settlers began to build a fort at the site of present-day Wilmington, Delaware. They named it Fort Christina, in honor of Sweden's twelve-year-old queen. It was the first permanent European settlement in the Delaware Valley. Along with Swedes and Finns, a number of the settlers were Dutch. Some Germans also came to the colony as soldiers in the Swedish army. 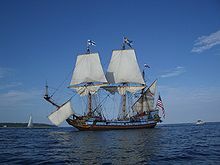 A replica of the Kalmer Nyckel, the ship that brought Anders Classon Mink to America, was one of the two ships who brought colonists to New Sweden. The replica was built at a shipyard in Wilmington on the Christina river near the original 1638 Swedish settler's landing site at Fort Christina. She was launched on September 28, 1997 and commissioned on May 9, 1998.